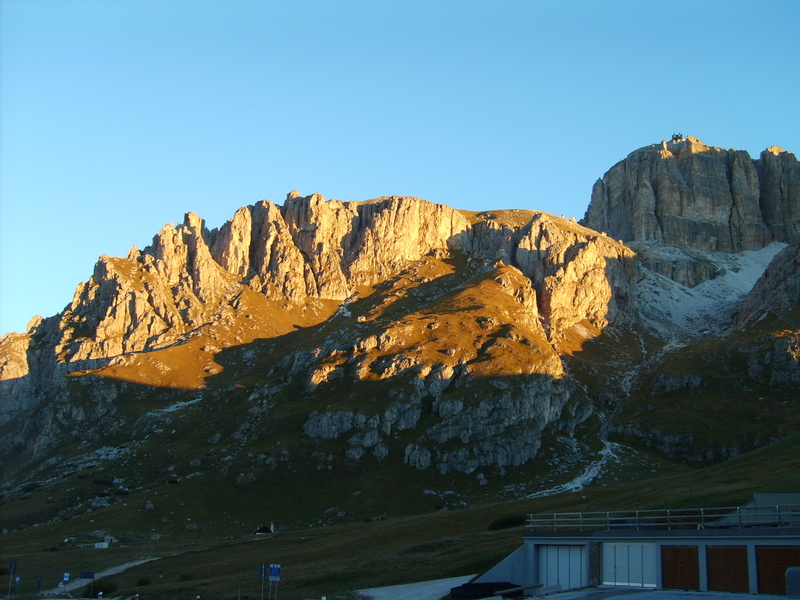 The landscape around the Hotel Savoia (which we highly recommend) is positively lunar as the sun rises. We are greeted by fog burning off outside, and a surprise guest inside – a fully-dressed Harley has joined us in the garage overnight. The garage functions as a ski rack in the winter time, when the mountains are covered with white stuff and skiers descend on them like flies on pigs. The openness to motorcycle tourism came about as the thousands of small guesthouses in the Alps discovered that the “off season” can also be profitable – riders flock to the passes as long as they are open, and with open wallets. Breakfast at the Savoia is well-covered, and we can’t say enough about this overnight, it will define accomodations for us for the remainder of the trip. We head out on SR48 and rejoin SS242 to go back over Passo Sella, this time with less traffic. 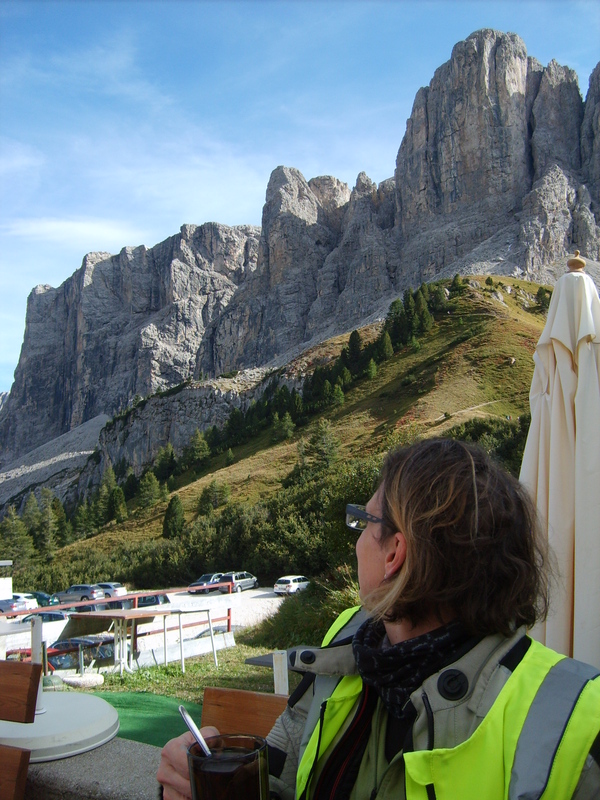 The mountain views are breathtaking and we spend plenty of time checking out the peaks that bring so much fame to Sella. 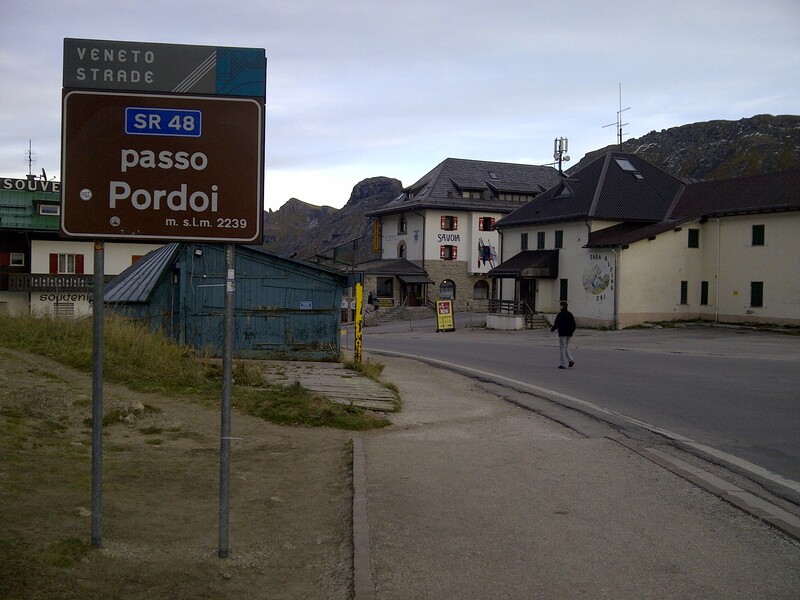 From Sella, we stay on the SS242 west to Ponte Gardena, where we pick up SS12 heading south to Bolzano. We join SS22 and find the three guys from the train and cows – some honking and waving and total shock that we actually did meet up go on. 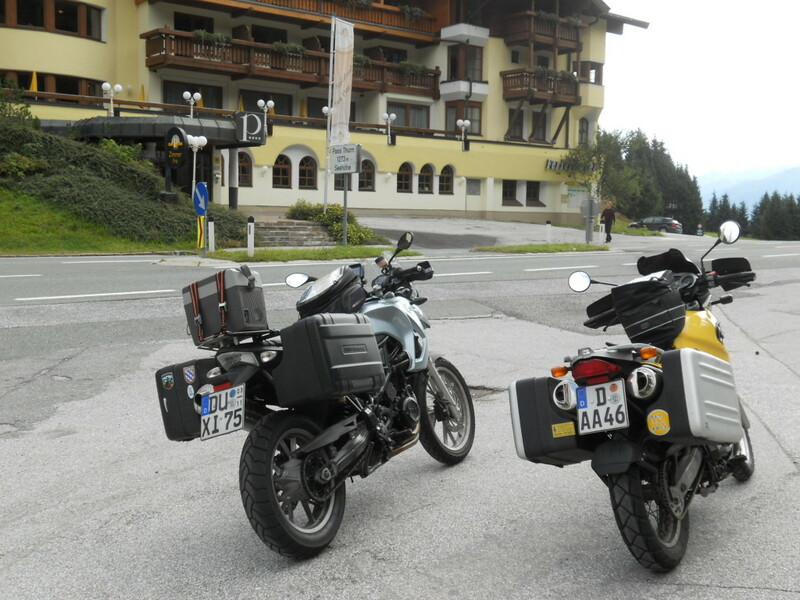 West of Bolzano, we pick up SS42 to Passo Mendola. 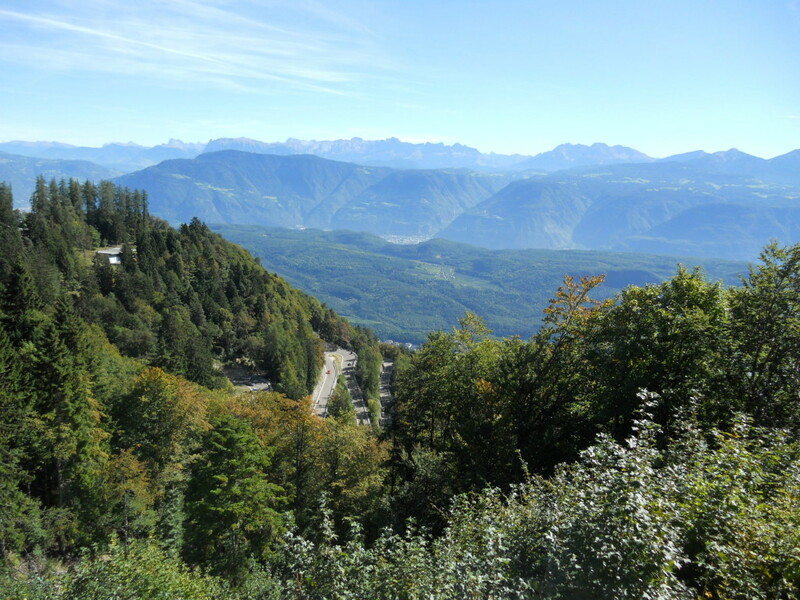 The approach to Passo Mendola is one of the most striking stretches we ride, with a stunning view of the valley below. For a long stretch, the narrow road clings to the side of the rockface and the mood is entirely surreal. 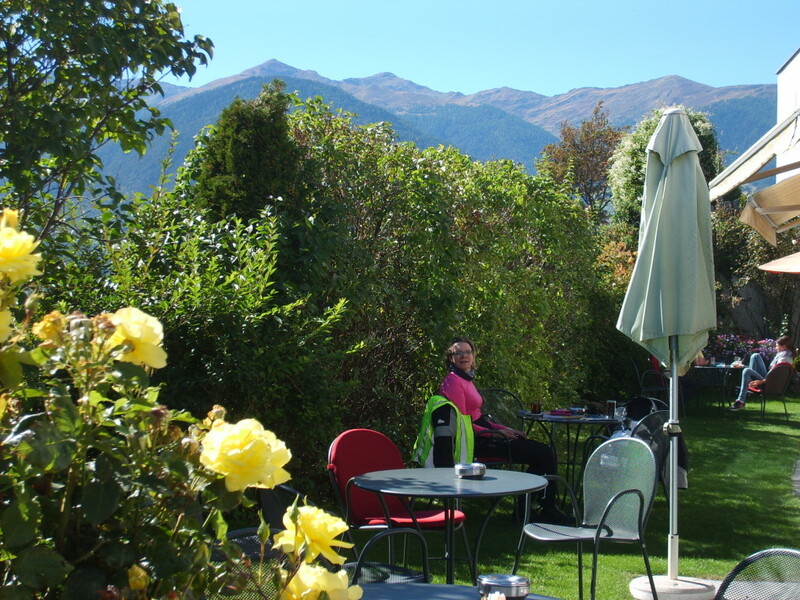 The final group of tornante bring us to the town of Roen at the top of the pass, where we stop for coffee and to admire the views. 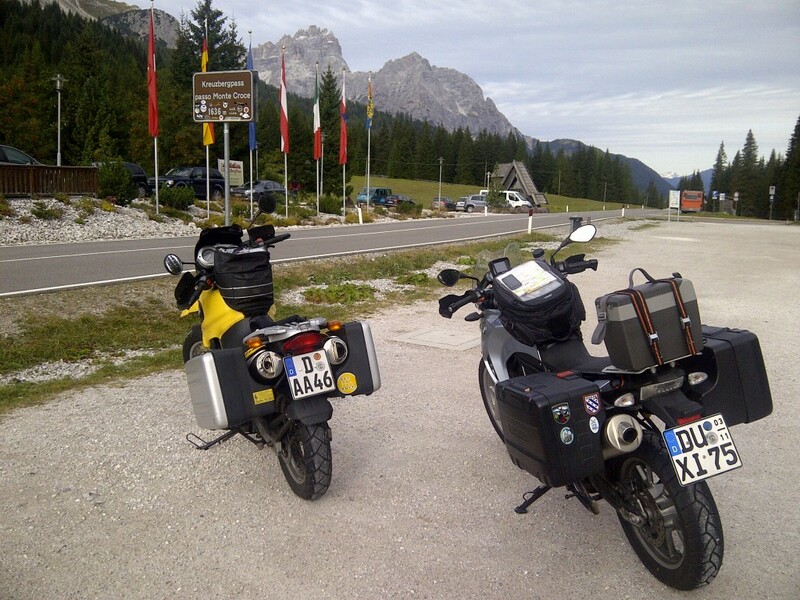 In Fondo, we tank up (250.3kms, 750,4km total) and are berated by a Bavarian Ducatisto who wants us to know that there is no passing in Italy. Perhaps he should have told the Italians? We ask him to speak German as his dialect is so thick. 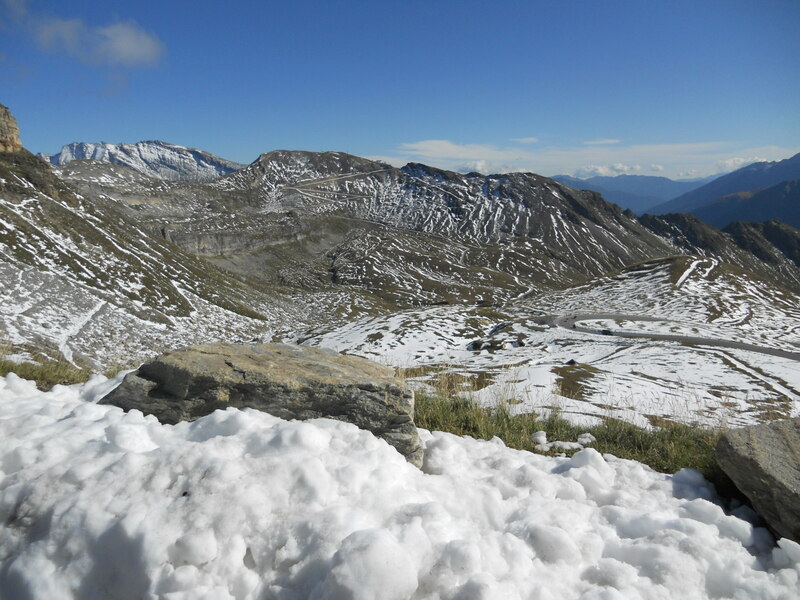 We pick up SS238 north to Merano crossing the Passo Palade. I expect more from Merano, the spa no connisseur of spas can miss, but it is quickly past and we are into a transit stage that will take us up and west on SS38 to Prato. 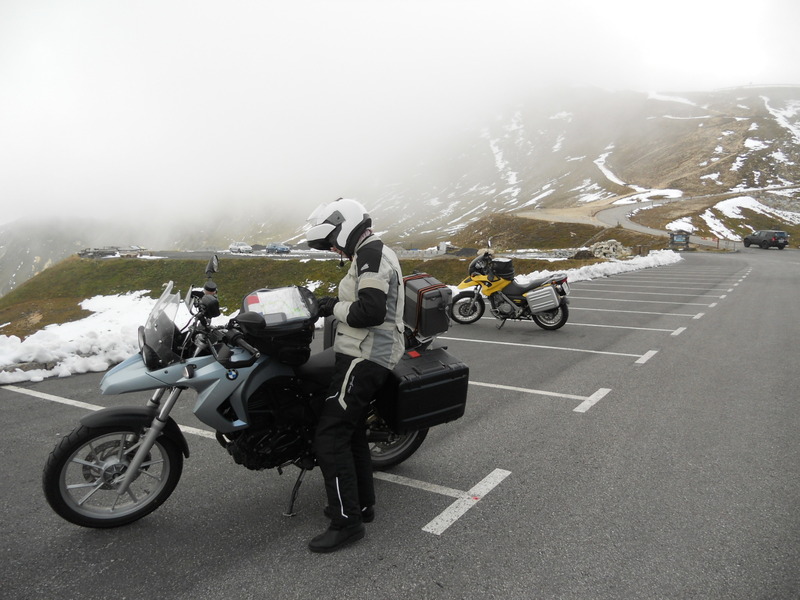 We have been riding parts of the Italian Wine Road since Bolzano, admiring the fruit orchards that line the road to within two meters of the fog line. 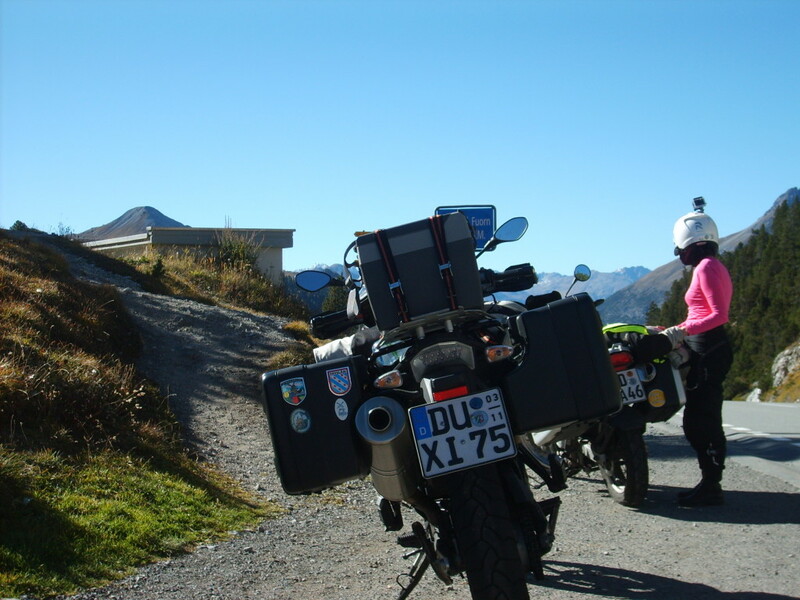 We stop for a quick lunch, then ride on with SS40 and SS41 (becomes 28) to the Ofenpass, where it is actually too warm to remain fully dressed. 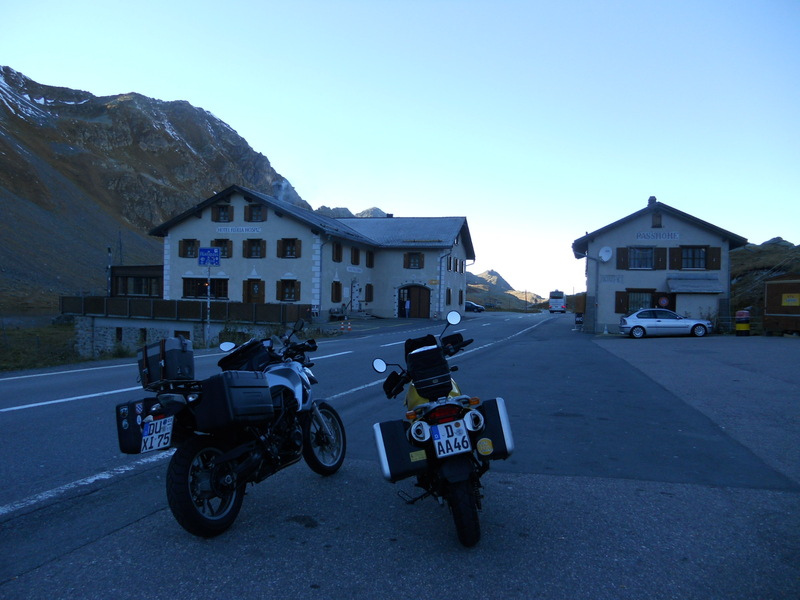 We finish the day at the top of the Flüelapass, where we discover Swiss prices. 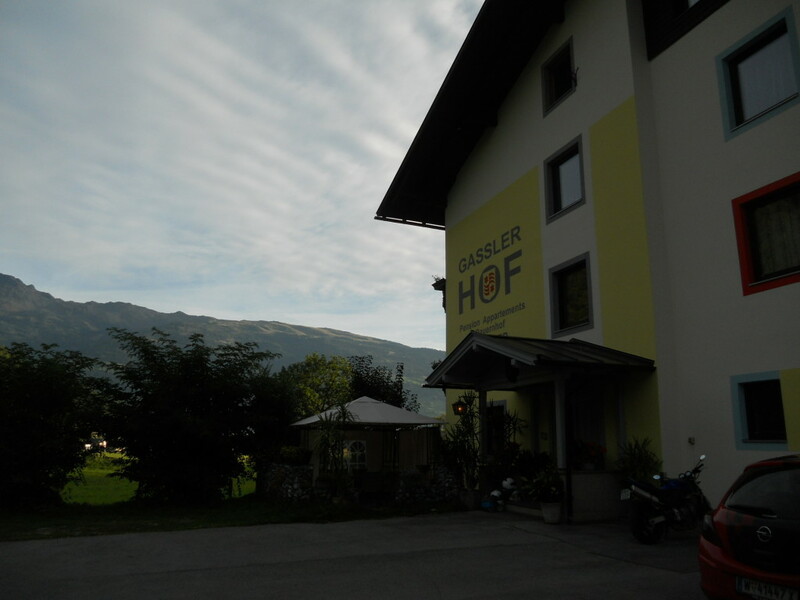 The Flüela Hospiz is as old as the pass and offers timely accomodations. This is a euphemism for out-of-date – we get a room with “washing possibility” – a sink – for 87€ each, including breakfast. Aside from the price and the warning to fully unpack the bikes and bring everything inside for the night, it is uneventful. Dinner is a welcome mix of traditional swiss Röstis and salad. I suppose it would be pointful to review the equipment. Comments: The bike was great, only issue was a siezed centerstand pivot that caused a tipover and resulted in a seat tear. The luggage was just right. Too many socks, should have gone for fewer pairs but all synthetic. The Falke ski socks were perfect, three pair would have done it. More lighter-weight tshirts would have been better – the skinny hipster cap sleeve ts were the best ones. I could have gone without the heavy polypros, a second pair of the Maier set is being sought out now. Very light weight meant very washable and dry within hours. This alone could cut the space required quite a bit. The jeans were a must-have. Not having to wash underwear was nice. The GoreTex outer gear worked perfectly. Absolutely the best decision of the planning phase was to go with textile over leather. Flexibility was fantastic thanks to the easily removeable liners. The (old) City gloves paired with the silk liners made the normal cold-weather gloves unnecessary. Even in heavy rain. The Garmin nüvi unit worked (and continues to work) well, even for motorbiking. The routes were developed in BaseCamp and uploaded to a microSD card in the device, then installed as needed. One issue was identified with routes having multiple loops from a single point, the unit would attempt to shorten the route by cutting out loops. This should be minded by users. 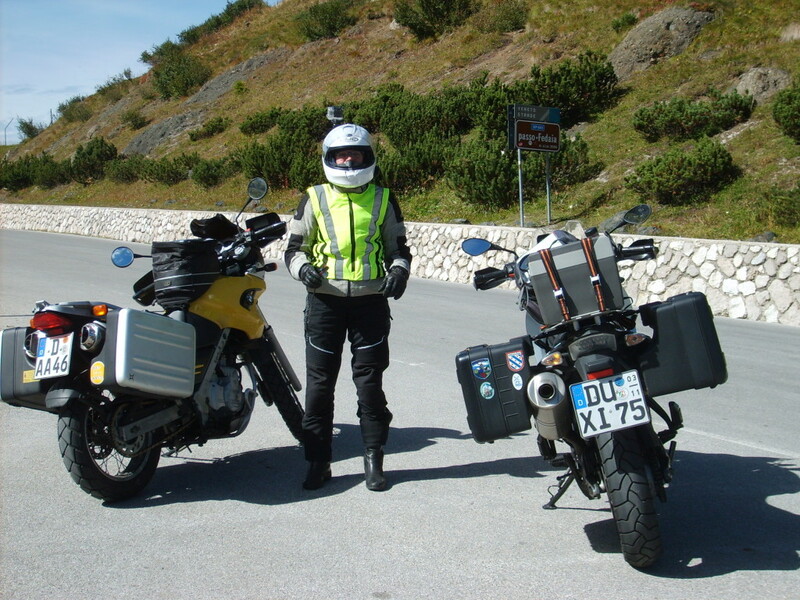 The GoPro (helmet-mounted) produced good, if not publishable, videos, due to the rider talking too much in her helmet. Thankfully, the GS911 and little LG phablet were not required, but took up so little space that it would be silly not to bring them. The BlackBerry had connectivity in nearly every place we went, allowing at a minimum email and BlackBerry Messenger communication. The little Nikon produced characteristically good pictures in all light levels. The BTNext unit was unused. Overall comment would be to refine the clothing packing and the tool packing. I made a custom tool roll to pack only the tools I felt would be useful, but even this was likely too much. 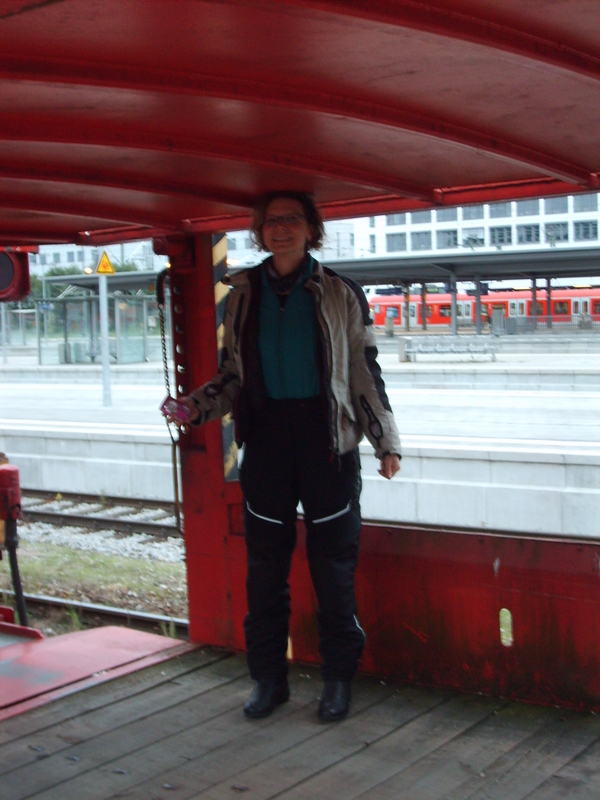 In a less redneck bike (see swapped motor above), I would be much more comfortable traveling with fewer tools. More GoPro locations will be explored. 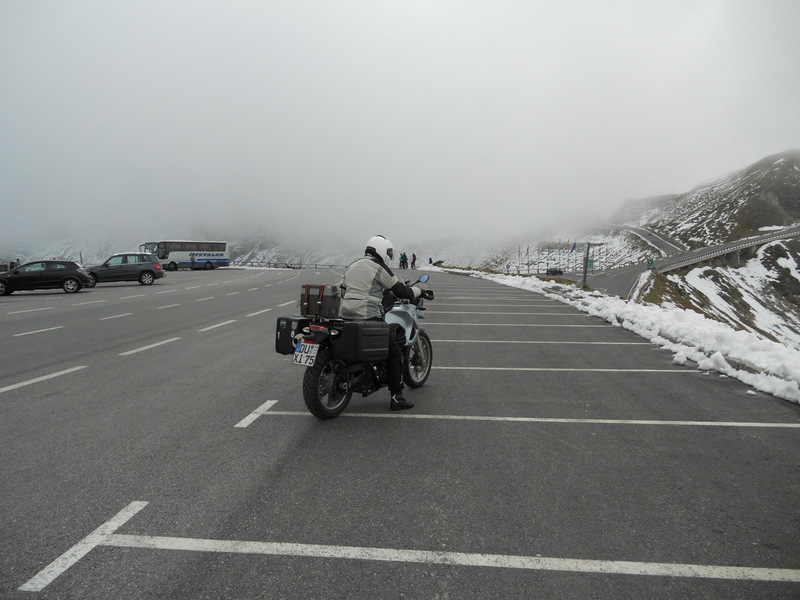 If I’d guessed that I would end up sleeping on top of the Alps at one point, I would have never believed myself. The sunrise in Linz is beautiful. Tucked into a mountain valley, we watch the sun fall over the farmyard prior to taking off from our feathery nest. 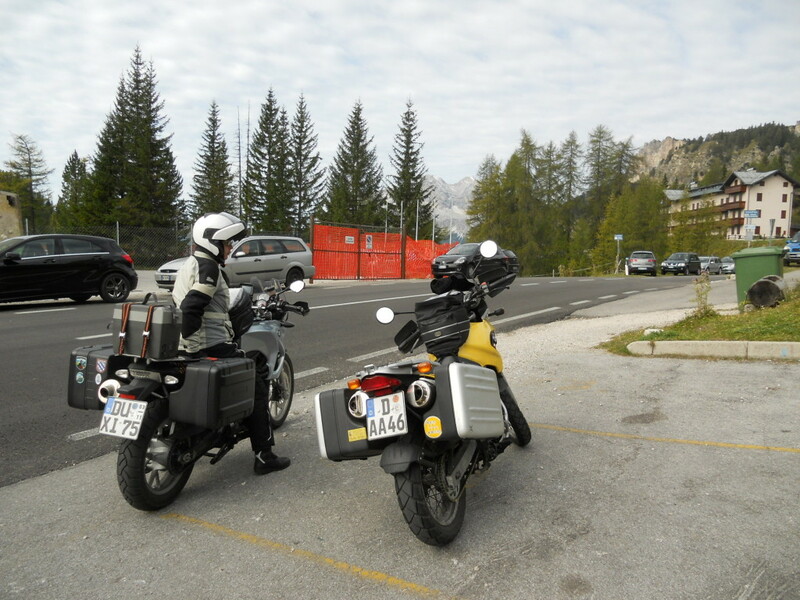 We head west on the 100 toward San Candido, and in the process beginning a day that would end with nine passes surmounted. 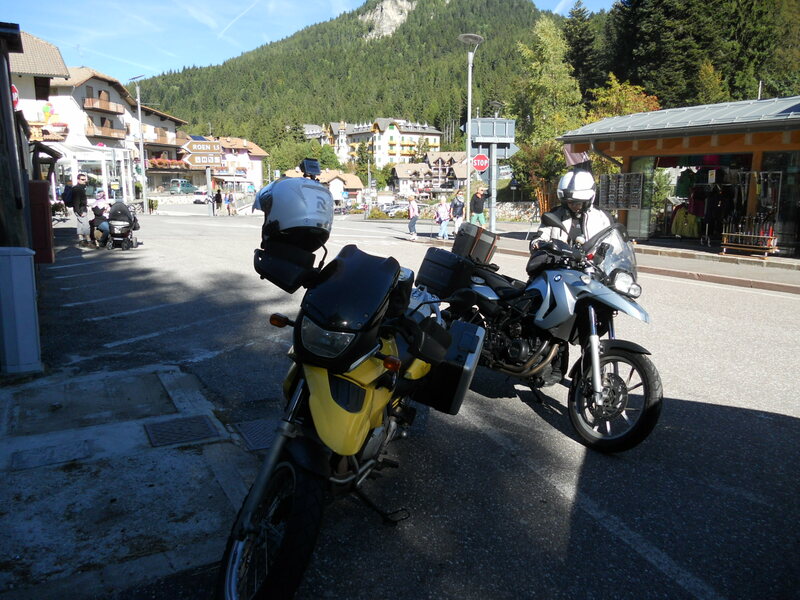 We cross into Italy, and on the Stata Stradale 52 (SS52), meet the first pass of the day – the Kreuzberg Pass. For the most part, a basic pass that is surmounted without event. 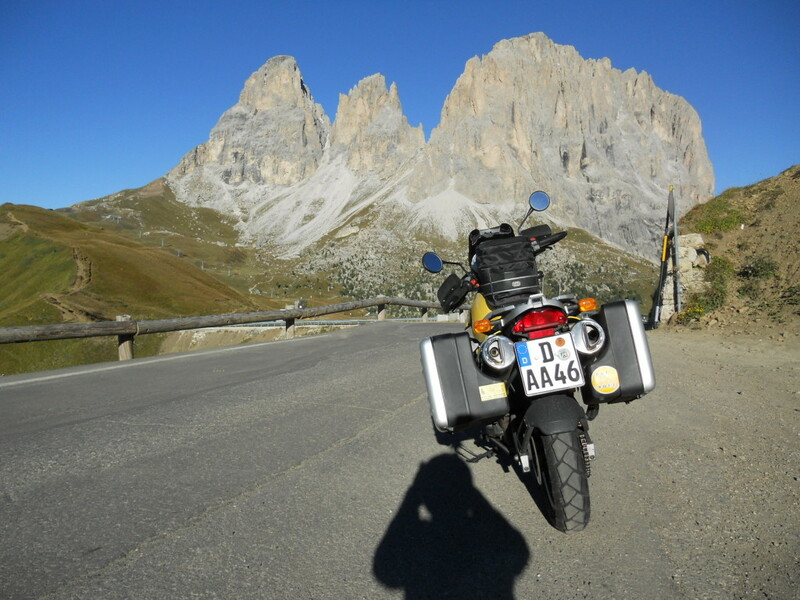 Turning off onto Strada Provinciale 532 (SP532), we ride over the Passo San Antonio and, on Strada Regionale 48 (SR48), the Passo Tre Croci without stopping – nothing to stop for, as the signs are almost invisible and there are no souvenier huts to buy stickers at. Yes, we collect stickers for every pass we can get them for. 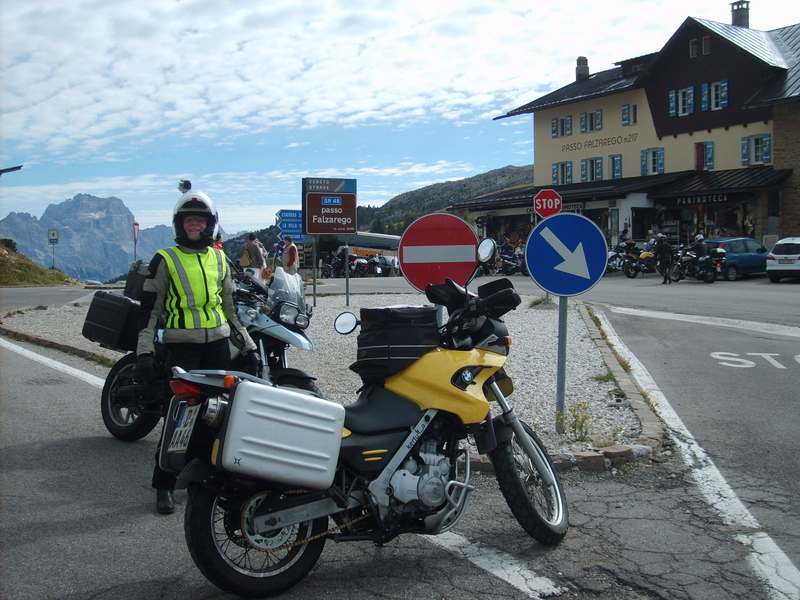 The fun really starts further along SR48 with the Passo di Falzarego, where we photobomb a bunch of Swiss guys trying to take a group shot at the pass sign. 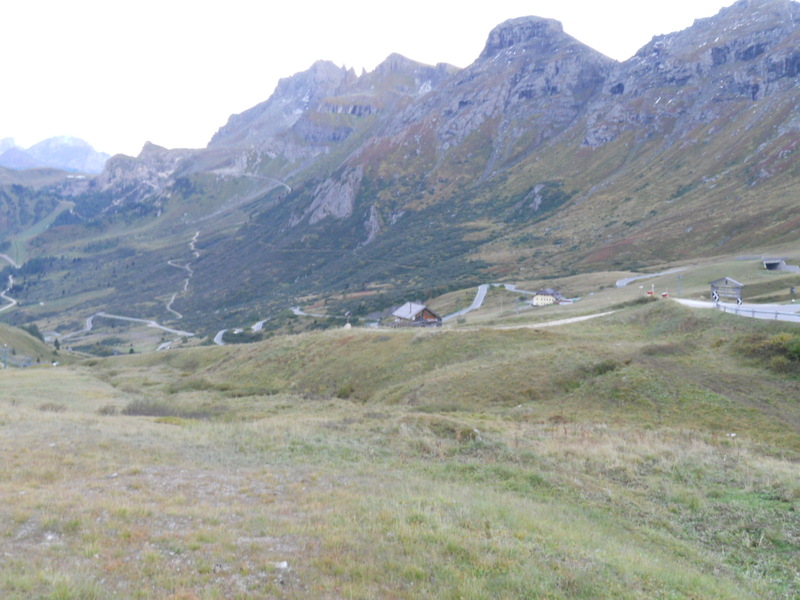 From Falzarego, we head west on the north side of the Marmolade Group, to better see the peaks. Stunning from the road, for sure. We have our first experience with Italian fuel stations, which are not open normal hours and require use of an automat. 252,3kms for a total of 500,1kms. Figuring that out is so exhausting that we have to sit down and eat lunch. We turn south on SR203, then onto SP641. 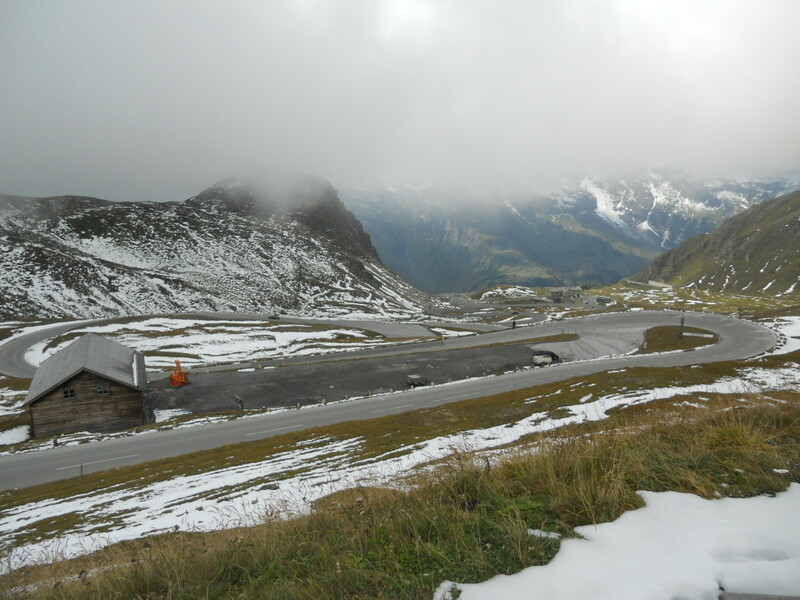 Next up is Passo Fedaia, with a beautiful view of a Stausee (retention lake) high up in the middle of the group. 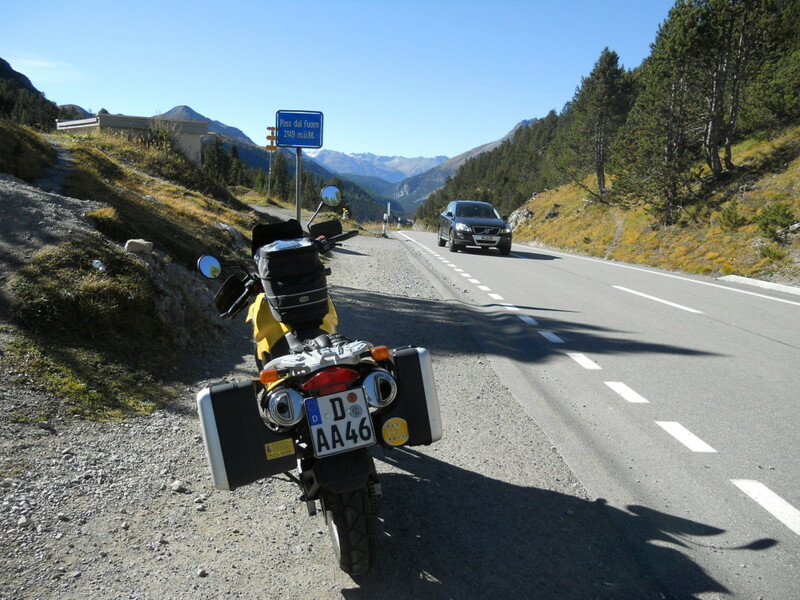 From Fedaia, we briefly rejoin SR48 and enter the venerable Sella Group on SR242, and meet the first real traffic of the trip. 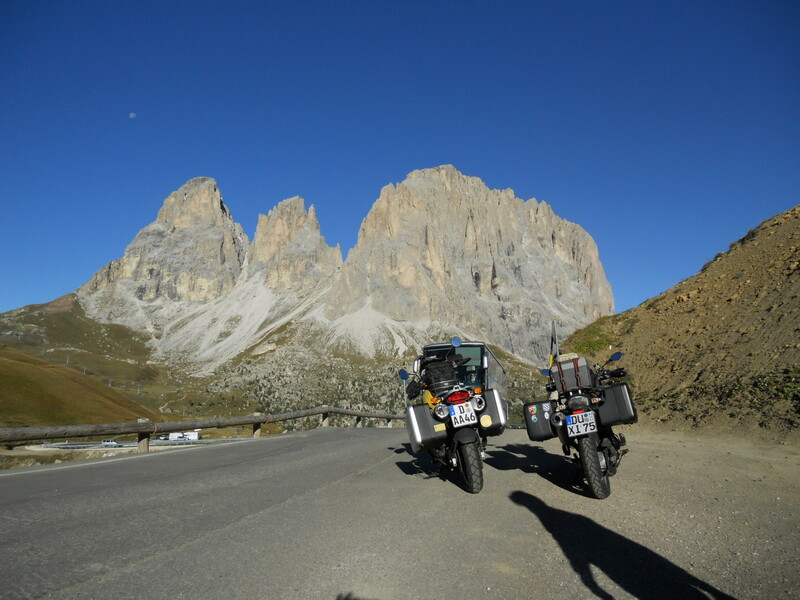 The Sella Group offers some of the most profound scenery of the entire trip. The terrain varies from gently rolling meadows to Martian landscapes. 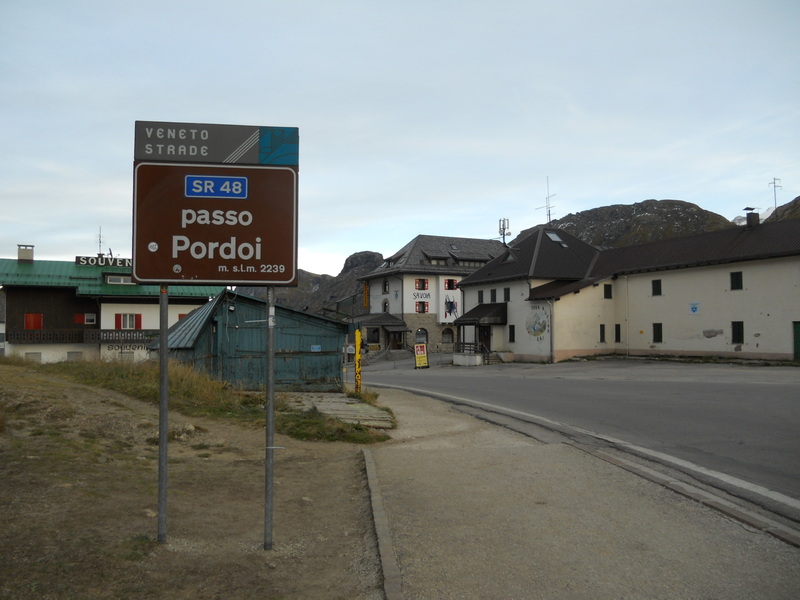 The first ascent is to Passo di Sella (Sellajoch), and is miserable with tourist busses. The traffic is very heavy and very unfun. When we halt at the top, we wait for a gap in busses before beginning the descent. 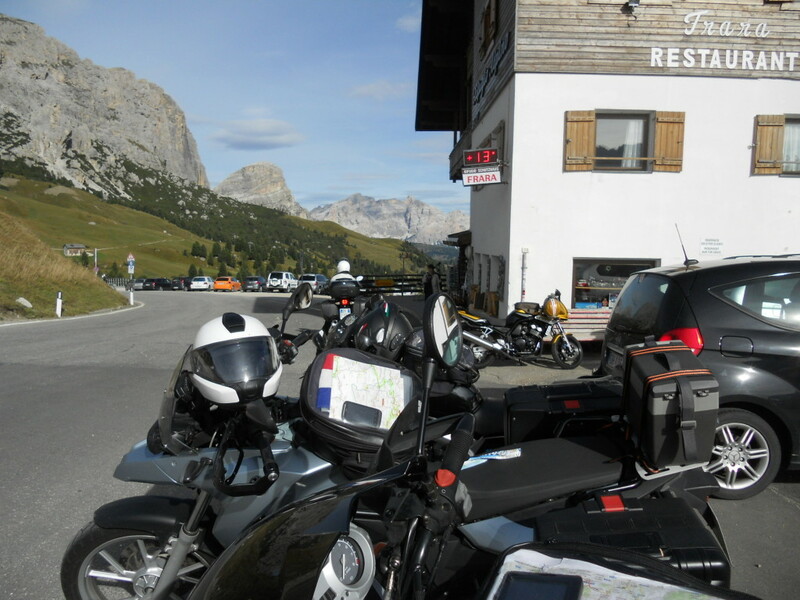 We ride the rest of the Sella circuit clockwise, turning onto SS243 to ride through the Grödner Joch (Passo di Gardena), where we encounter a group of elderly tourists with an endless parade of questions, starting with “Why do your motorcycles have BMW stickers on them?”, “Are those real BMWs?”, “Did you ride those here all by yourselves?” and continuing on. 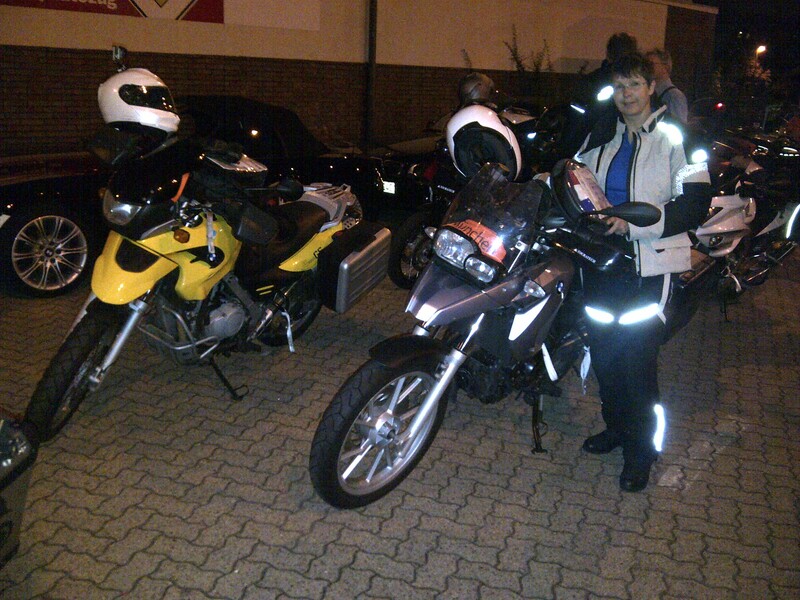 After a few more, I inform the small crowd that all info on the bikes is available at their local BMW dealer. 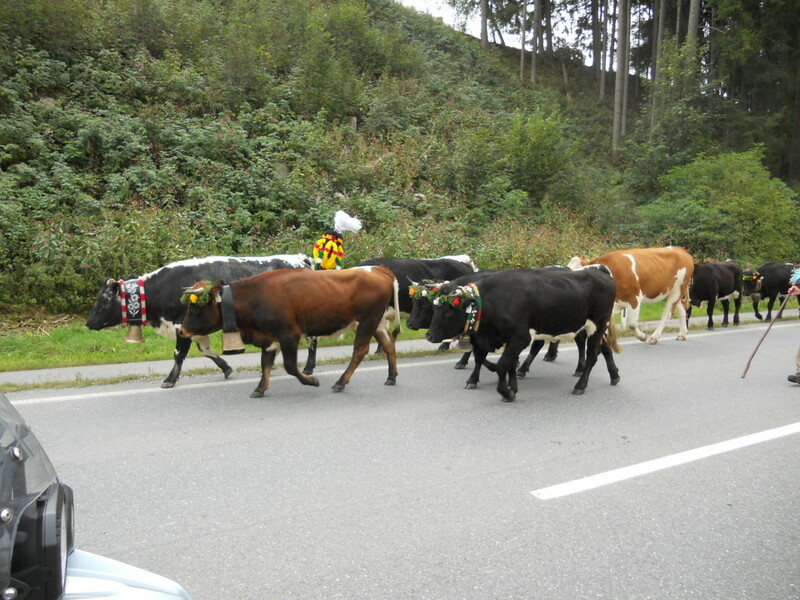 We ride on to SP244 over the Passo Campolongo (nothing to stop for), and finish the day on SR48 on top of Passo Pordoi after a quick 33 tornante ascent that counts as one of the highlights of the trip due to the absence of traffic, the road character, and the unusually curious cows penned at the roadside. 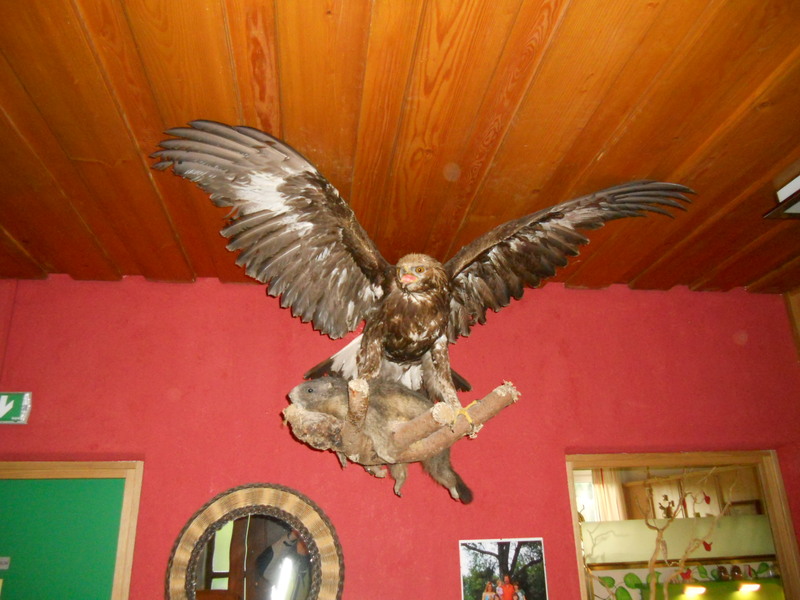 We hole up in the Hotel Savoia for 50€ a head including breakfast, garage, and a four-course dinner. We highly recommend this hotel. Excellent service, food, and accessibility. The AutoZug is not for the faint of heart. 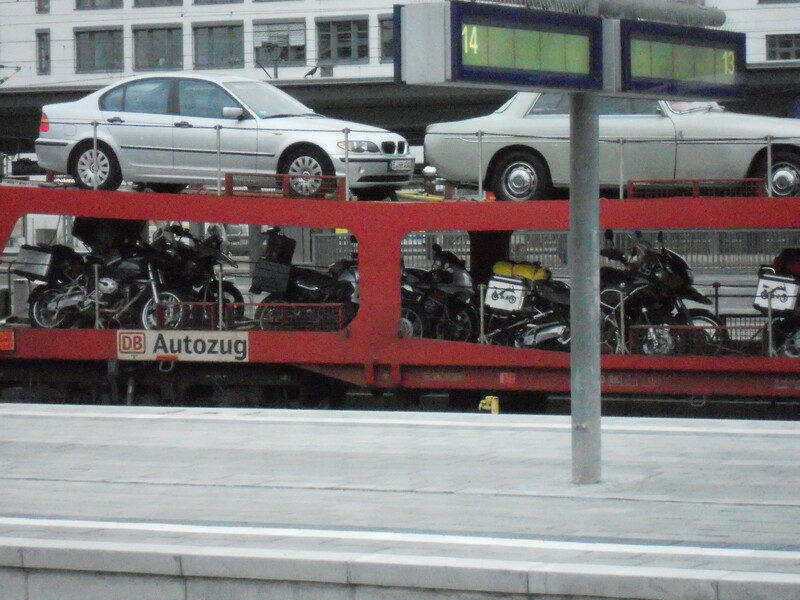 The carriers are two-level and motorbikes live on the lower floor. The clearance is 1.56m, shorter than me. 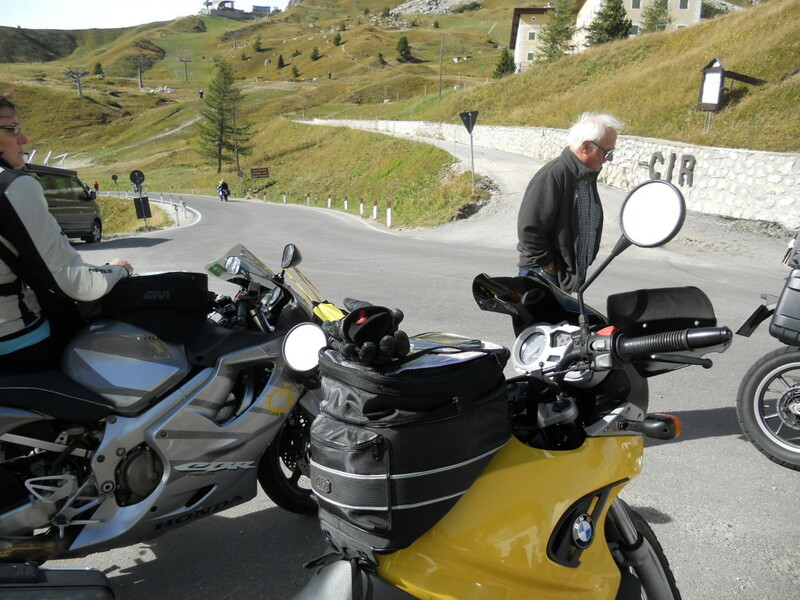 Motorcyclists attach tiedown straps to prefered points on their bikes, ride them in, and ride out after the trip. I rode in with my chin bar firmly pressed to my tank bag, and was warned to remove my GoPro from my helmet. Rats, I really wanted that on video, too. 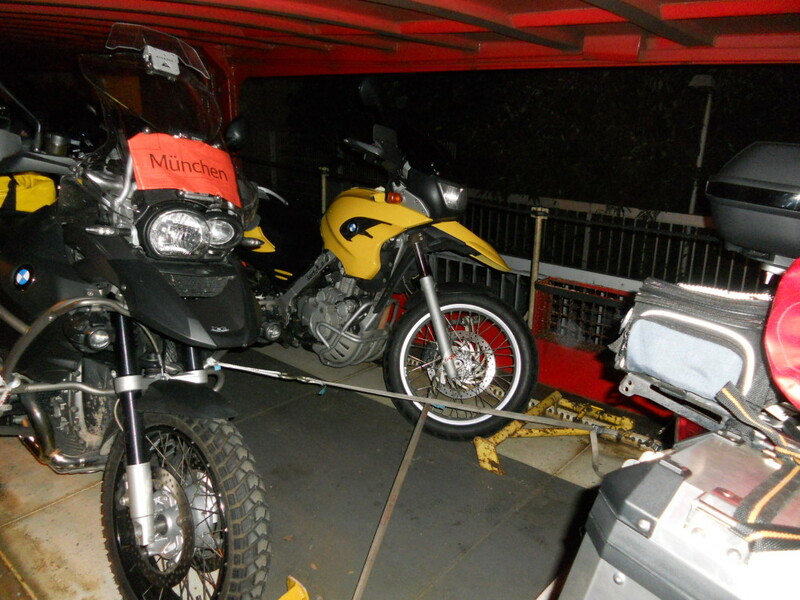 The DB crew moved in and secured the bikes with cleats front and rear and tiedowns. 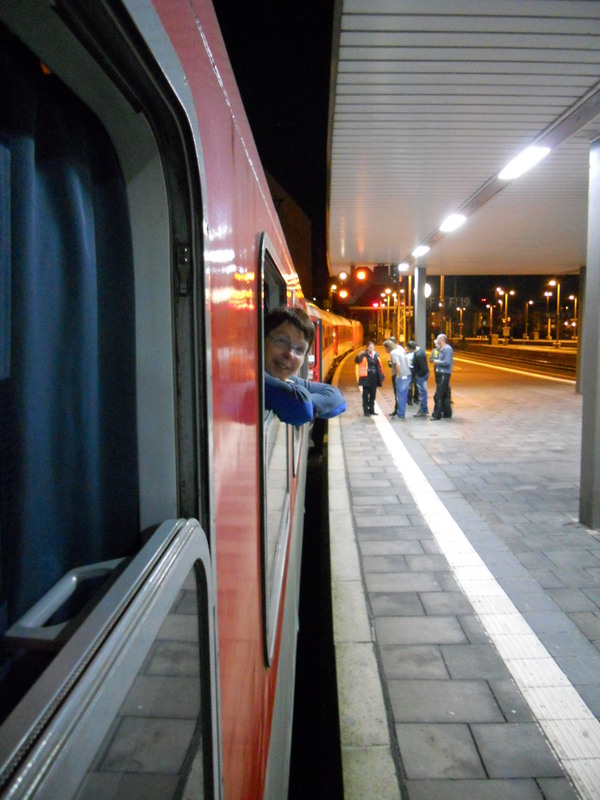 We booked a compartment for ourselves – adding about 15€ per head to the ticket price. As we managed to get a pretty smoking deal on the tickets, this was a logical upgrade. 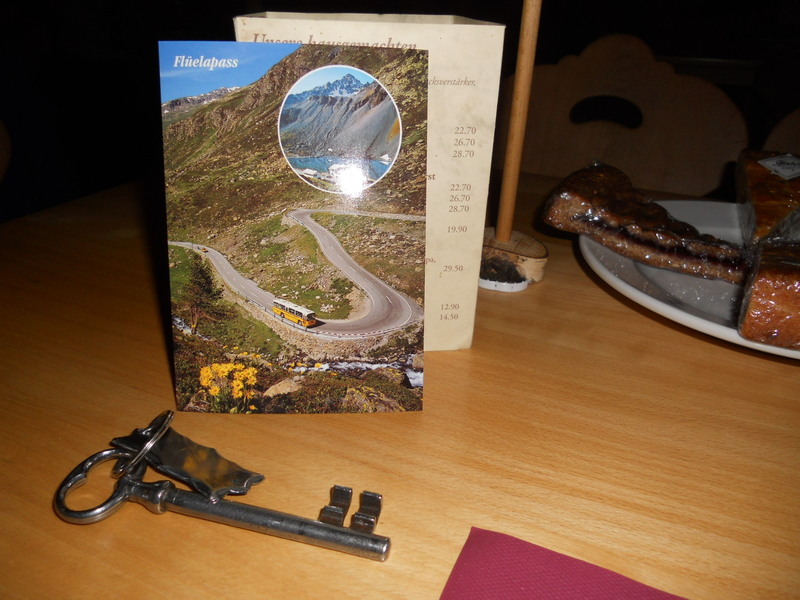 187€ total, including two passengers, two bikes, and two breakfasts. By booking the entire compartment, we did not have to deal with anyone else. 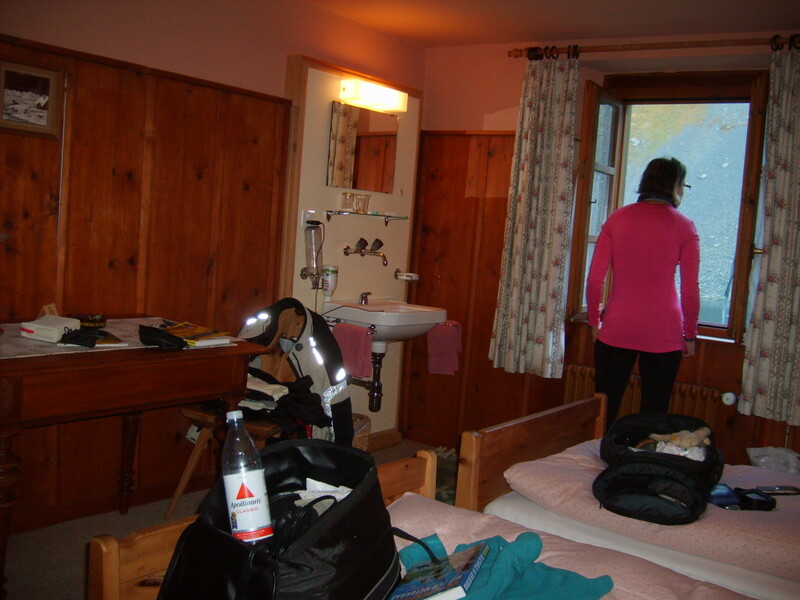 Many groups had the same idea – the three guys were two cabins over. The changing in the hallway thing worked for them, but not us. 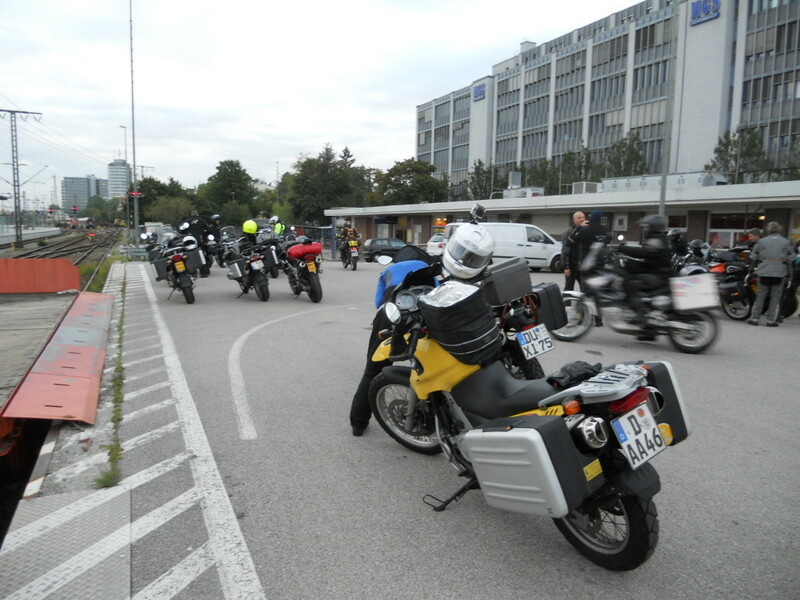 On the other side was a group of five riders, also bound for the Alps, but east instead of west. 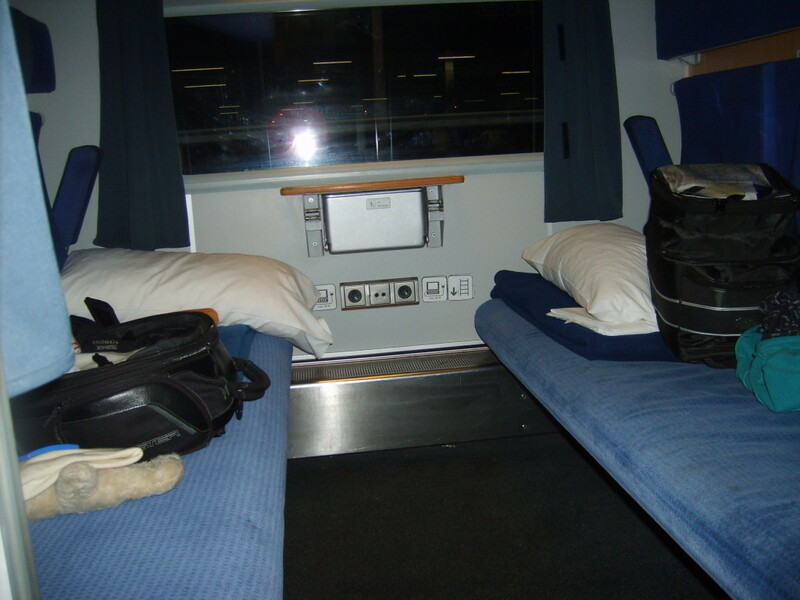 DB equips the compartments with standard european power outlets, plenty of lights, good curtains, and these things that function as beds. It all adds up to a decent way to get some sleep and distance in, at least for what was going to be a transit stage anyway. 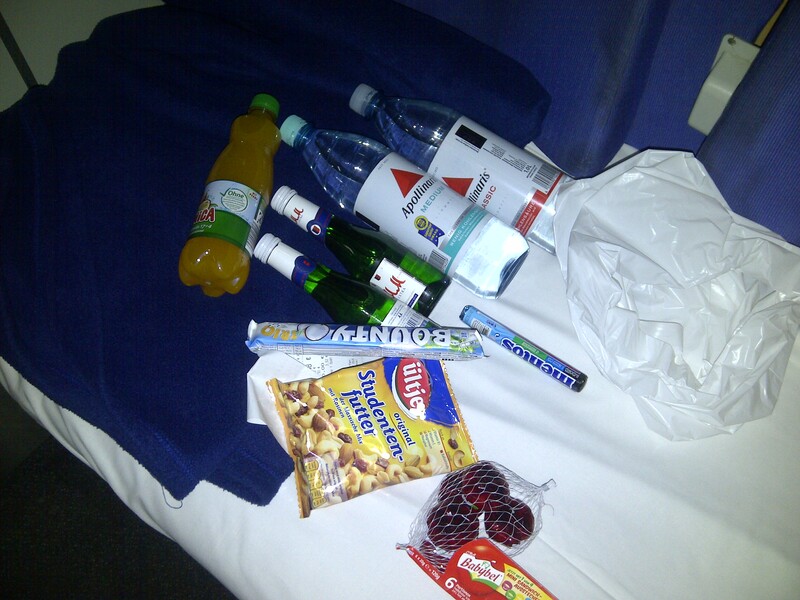 I collected some additional items at the Bahnhof grocery store, and we tucked in for the night. Getting off the carrier is no worse than getting on. 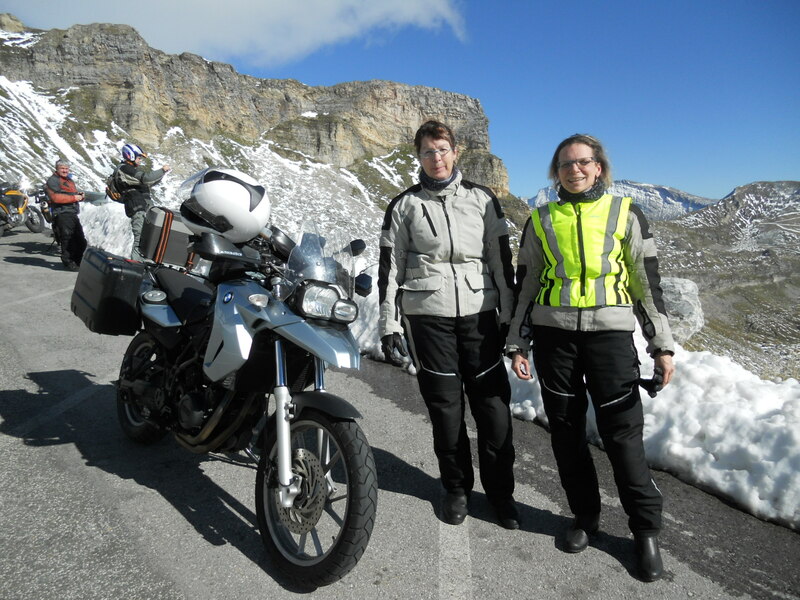 If you’re 2.2m tall and riding a GSA, it’s clearly not fun, but for short people on short bikes, it’s not that bad. Just don’t lift your head up. You exit the carrier into a deployment lot where the riders assemble and build up their bikes for the big trip. Any luggage carried into the cabin is remounted, and then it’s off on tour! We are the last out, as I wait for my riding partner to get her bike built. 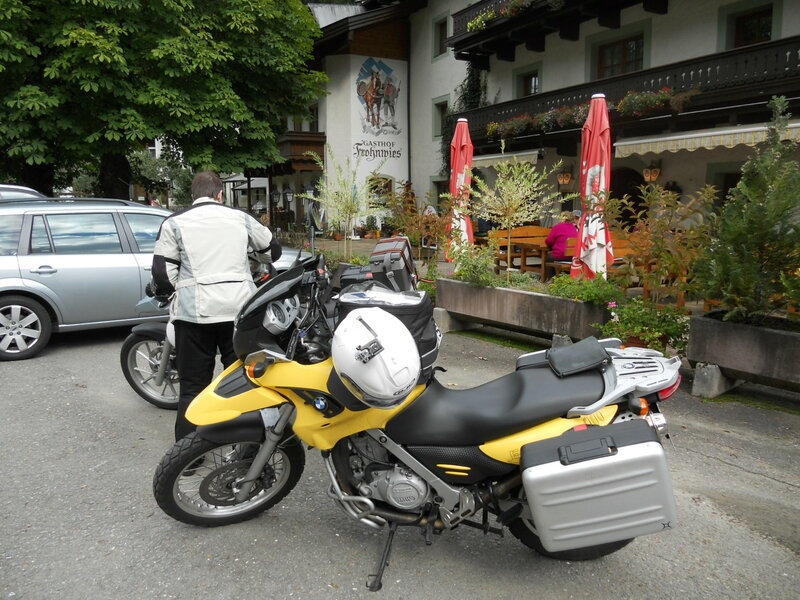 Day 1 is planned to take us first to the Sudelfeldstrasse and Tatzelwurm, then to Kitzbühel, Saalfelden, and down the Grossglockener Hochalpenstrasse to Linz, Austria. 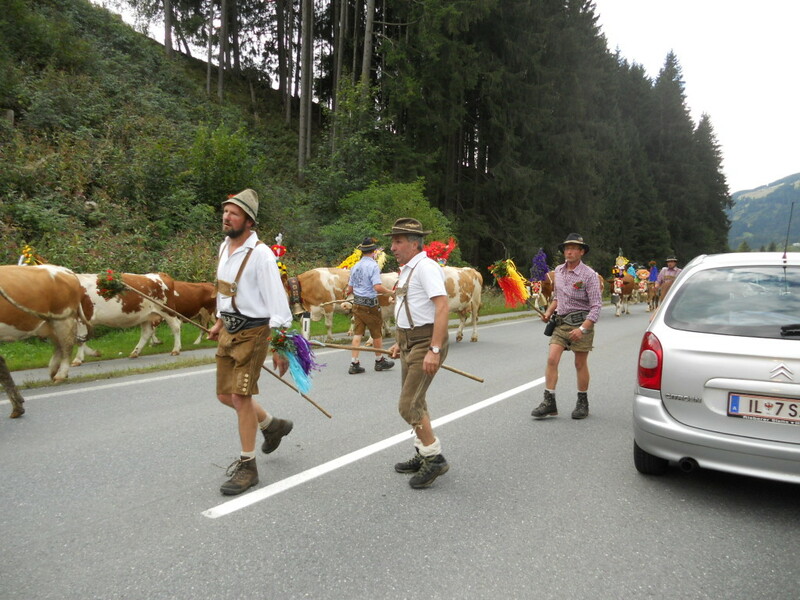 We start off on the A8, southbound to the B307 and the Tatzelwurmstrasse. 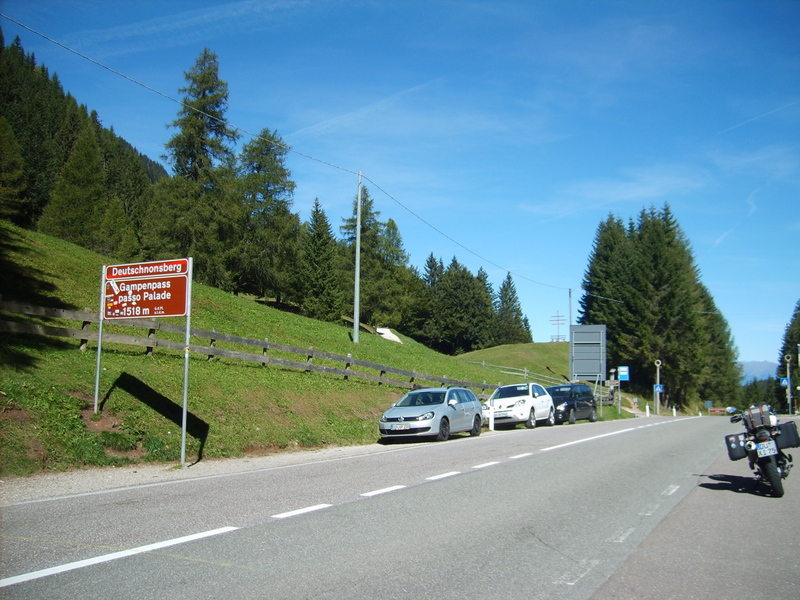 The Tatezlwurm consists of a few linked up Kehren, or switchbacks, but not much else. The scenery is pretty, though. I’ll continue to use the words Kehren and tornante to describe these turns, depending on where I am at the time. 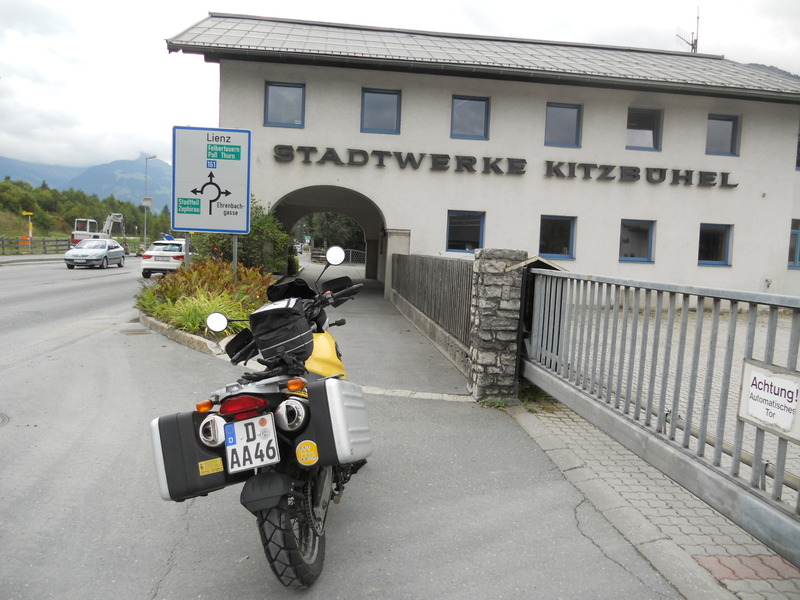 From Kufstein, we head across the B173, B178, and B161 down to Kitzbühel over Pass Thurn, the first real pass we took. 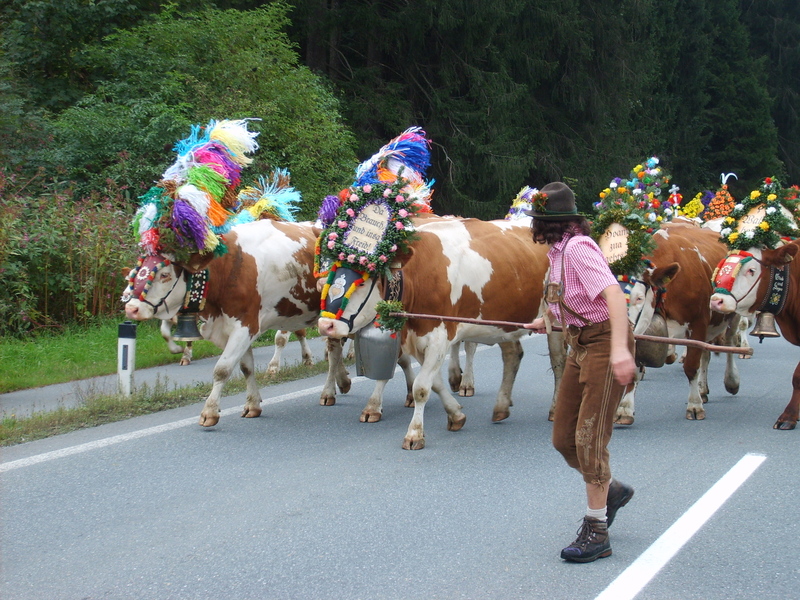 On the way, we stop for a bunch of decorated cows, the annual Almabtrieb in which the cows are driven down from the mountain peaks into the valleys for the winter. At this point, we run into the three guys from the train for the first time. 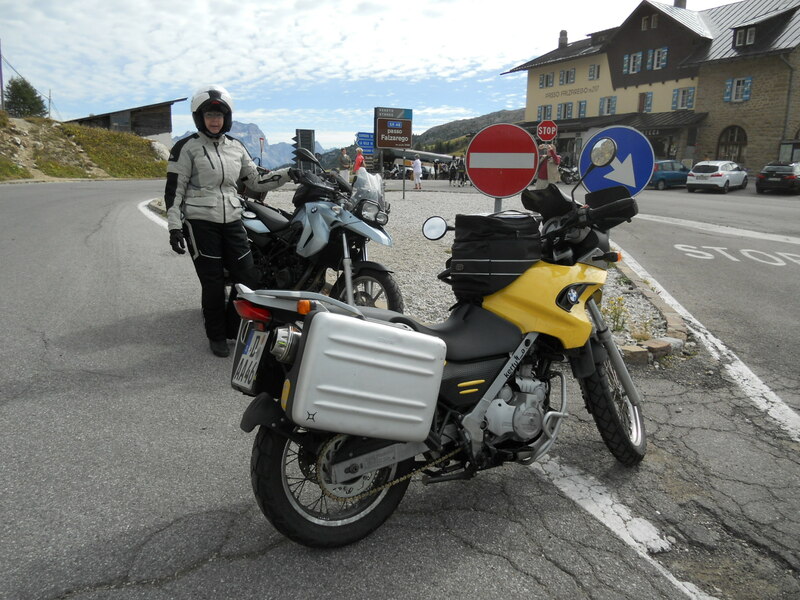 At Pass Thurn, a tourist bus driver moves his bus for us so we could take a photo with the pass sign. 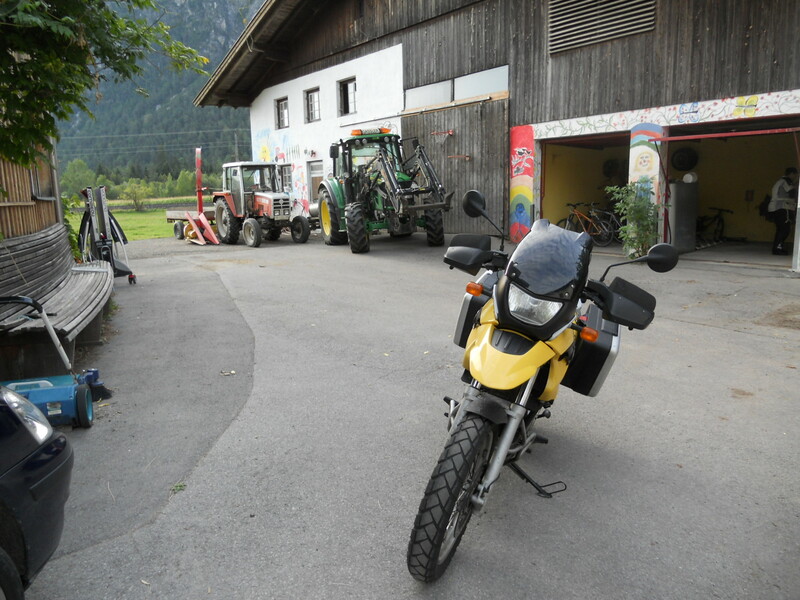 From there, it is across the B168 and stopping for fuel (285.2kms on the odo, total 247,8 total), then up to Saalfelden for a quick shoppping stop and lunch at the Gasthof Frohnwies. 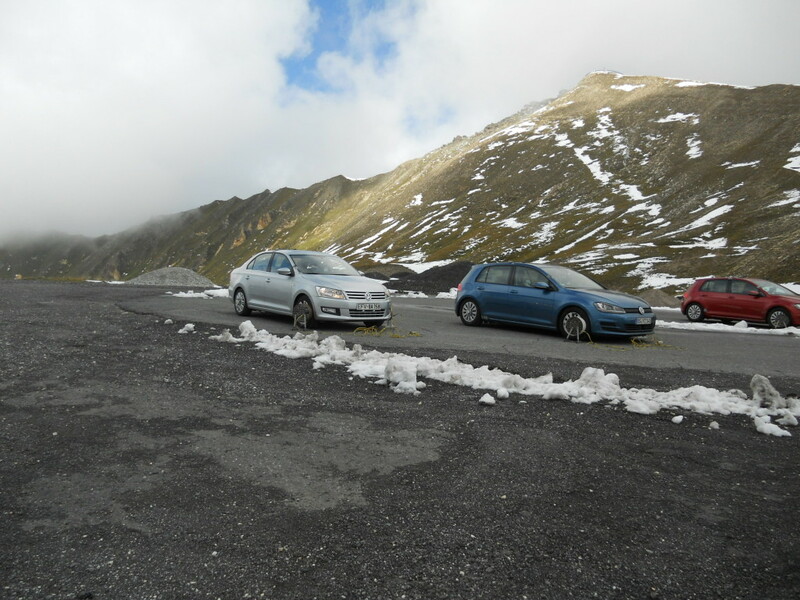 After lunch, we head on to the Grossglockener Hochalpenstrasse, one of the original Alps passes and the highest in Austria. 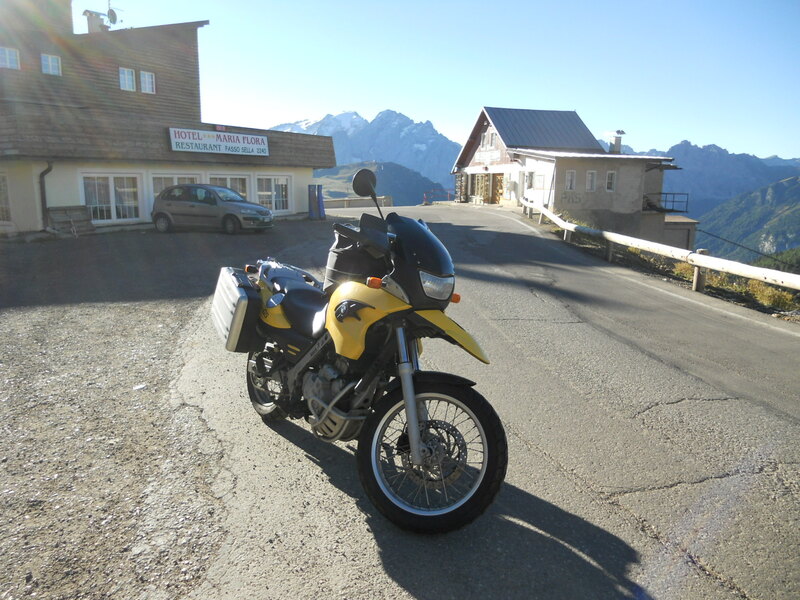 It consists of beautiful ascent and descent ramps and two actual passes, the Fuscher Törl and the Hochtor. The Fuscher Törl is in the clouds when we ascend, on the other side, the Hochtor is in the sun. Not bad for our fist big ascents. We avoid the Edelweisespitze as it is not only in a dense cloud, but paved with cobblestones, a surface neither of us love. 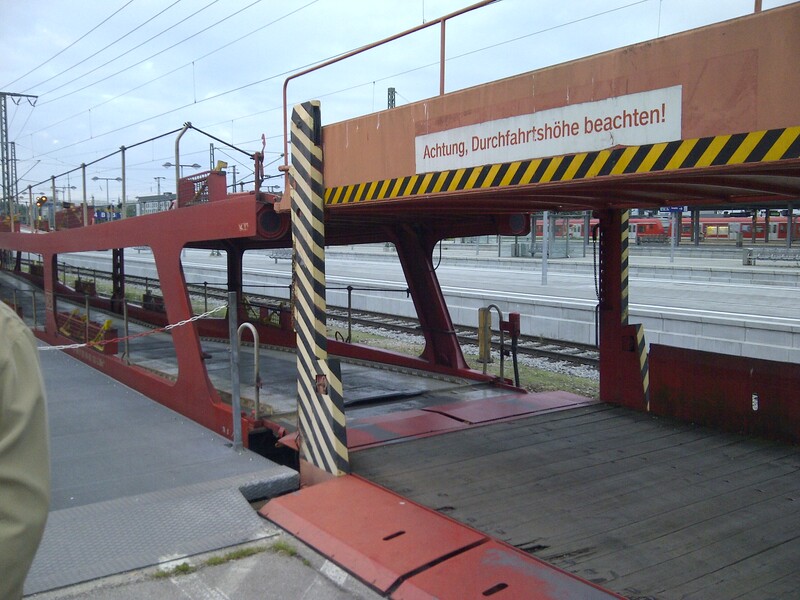 At the Fuscher Törl, we find cars being tested for braking function. We wind down the day by heading to Linz, and just past there, find a small pension that offers us room and board for the grand sum of 35€ a head. 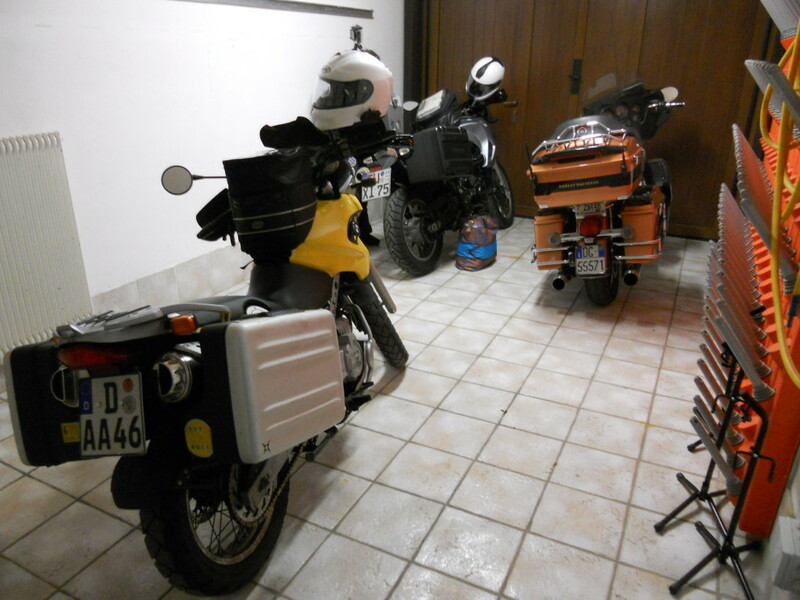 Including a garage for the bikes, not so bad! On the way there, I have to make an ugly uturn and my bike takes a nap, but no damage and those Vario boxes are a lot tougher than they look. 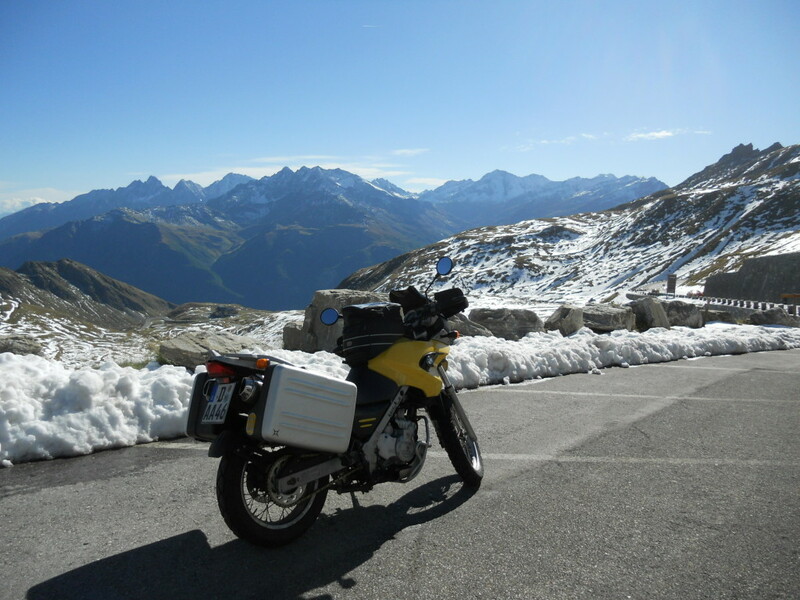 Going to the Alps to bag passes on the bike! I’ve planned an Alps tour with a GF. The idea was to allow ourselves some short cuts and extra roads to use, depending on how the trip goes. 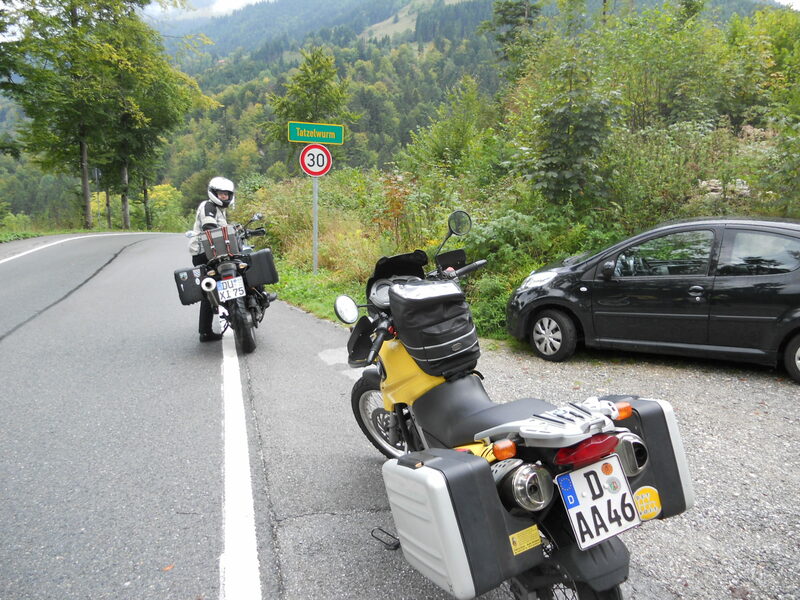 We may also take an extra hour to ride into Lichtenstein, just to say we were there.